Here is information about the Sony Debug Assist board. Note: Sony has made schematics and firmware source available as open source for this board!! Now, anyone can make their own copy of version 3 of this useful board. Please see https://github.com/sonyxperiadev/CDB-Assist for files and instructions. Specifically, the github repository has firmware source code, schematics, BOM file, gerber files for the board itself, manufacturing instructions, and other materials needed to make your own boards. This board is used internally at Sony Mobile for remotely managing phones and phone development boards. Internally, it also goes by the name "CDB assist". Although primarily designed for use with Sony Mobile phones, this debug board can be used with any device and allow control of power, buttons (like reset and boot mode buttons) and usb. The second USB cable presents to the host the USB connection from the phone's USB port. With these two cables, you can connect to the the pins or leads on the board for the serial console, or to the connections for buttons, so the board can close or open the circuits for the buttons. To see the status and control screen for the debug assist board, connect a USB cable from the "control" connector on the board to your Linux host machine, and on the host machine, access /dev/ttyACM0. This shows the voltage and current for the VBAT (power) outputs from the board, as well as the status of the lines that can be controlled from the board. Note that on some terminals, the voltage and current display are shown in a double-tall font. But on other terminals, the voltage and current display are shown as two duplicate lines (shown in this example). You can manually control the board settings by entering the letter for a particular function. Most line-control settings are controlled with a dual-letter combination where upper-case will turn the line on and lower-case will turn the line off. For example, to turn the power on to the device, type 'P' (capital-P). This corresponds to the VBAT power output lines from the debug board, and will turn on power from the debug board to the device. To turn the power off, type 'p' (lower-case-p). To set the power voltage, type 'u', then enter a number (in millivolts) for the new voltage. To set the power current, type 'i', then enter a number (in milliamps) for the new current. To close switch or button 1, type 'A'. This will close (and hold closed) the connection between lines A and A'. To open the switch (or release the button), type 'a'. To connect the vbus line on the pass-though USB connection, type 'V'. To disconnect this line (which will cause the USB connection to drop), type 'v'. This is useful because many form-factor devices require that certain buttons be held during boot or application of USB power (vbus) in order to enter debug or transfer modes. For example, Sony phones will enter fastboot mode when the USB cable is attached and the volume up key is held. The VBAT voltage for the phone should be set to 04000mV and the VBAT current should be set to 2500 mA. 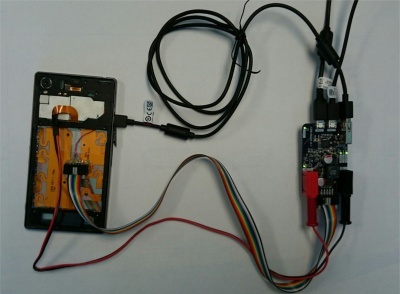 The phone can be booted directly to the installed kernel, or placed in one of two different bootloader modes, depending on the buttons held when the power button is pushed. The instructions below are manual steps typing things into the debug board control interface, to control the phone bootup and mode. MiscTA data not accepted by security manager! MiscTA unit 2473 could not be read! Service mode detected: [FASTBOOT] S1 decisions complete, image to boot is 4. You can see debug output (log data) from the Sony Debug Board itself, on another USB interface provided by the board. In Linux, this is provided as an additional HID interface ("hidraw" device). power cycle it and access its console from anywhere in the world. (for example holding down and releasing buttons). BeagleBone Black. Power control for that board was via the USB connector. a board and run a few relays, it can be quite handy. you can change the voltage and current provided by the onboard power-supply. If you don't have minicom, install it using 'sudo apt-get install minicom'. I use minicom, but any terminal program will work. the board, as this is simulating the battery to a cell phone. the power from the host machine to the target, you would press 'V'. the VBus line on the USB bus, you would press 'v'. with the Sony debug board. used to show it's control panel), on the host in /dev/ttyACM1. This serial device has the data from the serial console on the target. serial port cable to the bus pirate cable. the configuration file I use with ttc for my beaglebone black board. provided by the sony debug board. manually via the control panel. This page was last edited on 27 October 2018, at 09:55.